Plans to build a a "steel and glass" cafe on the Bristol Downs has been likened to putting a coffee shop in the centre of Stonehenge. The Downs Committee has been given permission to replace a toilet block at Sea Walls with the cafe. But residents opposed to the venture say it will damage the "iconic" setting and pave the way for the Downs to be "devoured by commerce". The committee said the cafe was the "only way" to keep the toilets open. City planners, who recommended the cafe for approval, said it was a "very rare scenario" and that other commercial proposals for the Downs would be unlikely to find favour with the council. Resident Geoff Hoult told members that Sea Walls was among a limited number of iconic natural sites and that future generations would not forgive them for allowing it to be commercialised. He asked: "Would you approve the building of a Starbucks in the centre of Stonehenge?" 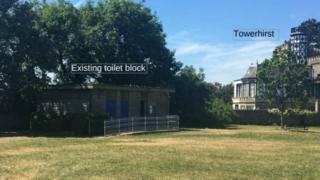 Labour councillor for Avonmouth and Lawrence Weston, Jo Sergeant, questioned whether there was any way for the council to prevent what was "effectively a self-funding toilet" from becoming a Starbucks or being sold to a purely commercial venture. The planning officer replied that the cafe's future was in the hands of the Downs Committee. "In planning terms, the proposal seeks planning permission for a cafe and it doesn't specify any particular cafe," he said. "Therefore, it could be a Starbucks. It could be any other chain of coffee shop cafe."